With the release of Blood and Fire’s Ride on Dreadlocks and the reissues of his catalogue of classic roots material, Linval Thompson‘s reputation as one of the finest reggae singers from the roots-renaissance was rightfully assured. 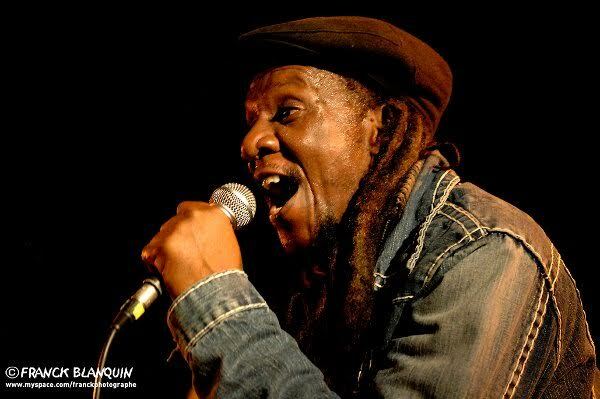 A prolific producer whose credits include Dennis Brown, the Wailing Souls, Eek-A-Mouse, Freddie McGregor, and the Viceroys, among others, Thompson has also released a number of his own vocal (and dub) albums through independent labels and his own imprints. Linval Thompson’s musical gifts were recognized early in his life when he began writing songs as a teenager. He made his first recording while living with his mother in New York. The composition “There Is No Other Woman” was a collaboration with future Third World guitarist Bunny Ruggs. Returning to Kingston, Thompson began working at Lee “Scratch” Perry’s legendary Black Ark studios under producer Phil Pratt: subsequently contributing to the Upsetter classic “Kung Fu Man.” Though early connections like this, and a brief stint with Augustus Pablo’s Rockers imprint, were invaluable, Thompson’s greatest success came when he established himself as a producer. Following his 1975 Bunny Lee-engineered debut, Don’t Cut Off Your Dreadlocks (released as Cool Down in the U.S.), Thompson and new assistant Henry “Junjo” Lawes produced the singer’s I Love Marijuana in 1978. Recorded at the famous Channel 1 studio, Thompson was backed by a rhythm section of Rockers’ drummer Leroy “Horsemouth” Wallace and the Wailers’ bassist Aston “Family Man” Barrett. The success of I Love Marijuana attracted many singers in search of Thompson’s sound. While the artists he produced throughout the late ’70s and early ’80s failed to achieve the same degree of commercial success, albums from Mystic Eyes and DJs Big Joe and Trinity still maintained the classic late ’70s roots feel. The beginning of the ’80s found reggae music in flux once again with the advent of the DJ-dominated dancehall style. Thompson (along with former employee Lawes) was at the forefront, tracking Roots Radics’ rhythms at Channel 1 and sending the results to Scientist for mixing. The collaborations with the former King Tubby producer resulted in dub titles like Scientist Meets the Space Invaders (1981) and Scientist Encounters Pac Man (1982). Thompson constructed his own dub-scapes as well, on Negrea Dub, Green Bay Dub, and Outlaw Dub. In 1982, Freddie McGregor scored a hit with the Thompson-engineered “Big Ship (Sailing on the Ocean)” (after which the singer christened his own label). It would be one of Thompson’s last major production successes: by the decade’s mid-point, his work load began to tail off. The genre had become infatuated with digital technology following the massive success of Wayne Smith’s “Under Me Sleng Teng” in 1985. Displeased with the new trend,Thompson preferred to recede from view, developing his Stony Hill property and dabbling in real estate. The singer continued to enter the studio occasionally, reuniting with longtime collaborator Robbie Shakespeare for his 1988 album Starlight. In the decade that followed, classic, out of print Thompson material began seeing the light of day once again through reissues from Majestic Reggae (Jah Jah Dreader Than Dread), Blood and Fire (Ride On Dreadlocks), and Trojan (Channel 1 Rockers), among others. The results were a clearer look at a body of work that, at its best, could rival Thompson contemporaries like Johnny Clarke, Horace Andy, and Cornel Campbell. Though well past his late-’70s, Thompson continues to make concert appearances and recording dates into the 21st century.